Start an HTTP server in R to serve static files, or dynamic documents that can be converted to HTML files (e.g., R Markdown) under a given directory. A simple HTTP server to serve files under a given directory based on the httpuv package. This package is licensed under GPL. Similar to httd(), the function httw() can both serve and watch a directory. If you are viewing an HTML file in the browser, it will be automatically refreshed whenever there are any changes in the directory (e.g. you added, deleted, or modified certain files in the directory). Besides httd(), there are functions jekyll(), rmdv1(), and rmdv2() in this package to serve HTML files generated from R Markdown documents (via knitr or rmarkdown). R Markdown documents can be automatically re-compiled when their HTML output files are older than the corresponding source files, and HTML pages in the web browser can be automatically refreshed accordingly, so you can focus on writing R Markdown documents, and results will be updated on the fly in the web browser. This is even more useful when you write R Markdown documents in the RStudio IDE, because the HTML files are displayed in the RStudio viewer pane, and you can put the source document and its output side by side. 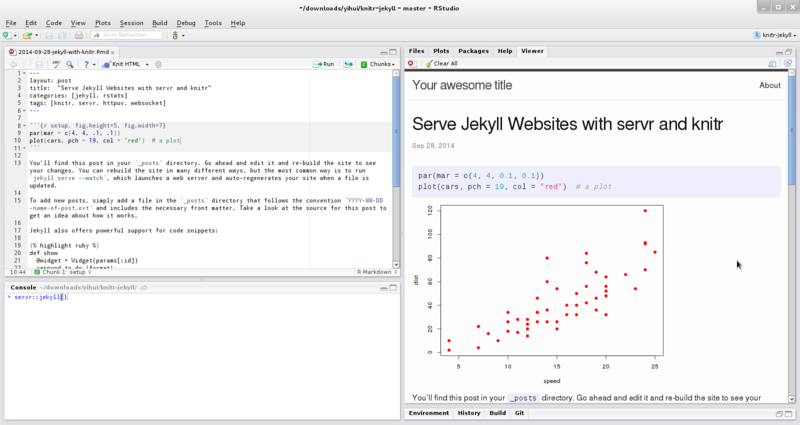 The function vign() can be used to serve R Markdown/HTML package vignettes. The HTML output files are generated and displayed in the web browser so you can preview the vignettes, and they will be cleaned up after they are loaded in the web browser to make sure your source package is clean. All server functions can be used in the daemonized mode, i.e., they can be non-blocking in the R session, which allows you to continue working in the R console after the server is launched. This mode can be set via the argument daemon = TRUE in most server functions. See ?server_config for more information. Added a verbose argument to server_config(). The interval argument of server_config() can be set via the global option servr.interval now. For example, options(servr.interval = 0.5). Server functions such as httd() now return the config object created by server_config() instead of the server handle returned by httpuv::startServer(). The config object contains various information about the server and methods to start/stop the server. Exported the function random_port() to return an available random TCP port. daemon_list() returns server IDs instead of handles, so that it will work with httpuv >= v1.4.5.1 (rstudio/blogdown#365). The default value of the port argument of server_config() can be set via the environment variable R_SERVR_PORT. If the environment variable does not exist, the global option servr.port will be used if set, e.g., options(servr.port = 4322). See ?servr::server_config for details. Added a function browse_last() to reopen the last browsed page. The daemon argument in server_config() now defaults to interactive(), i.e., servr starts a daemonized server that does not block your interactive R session by default. The web browser may be opened too early (before the server is ready) (originally reported at rstudio/rstudio#2475).